Judges June Tainsh and Liz Stewart were shown around the Montague Street gap site. 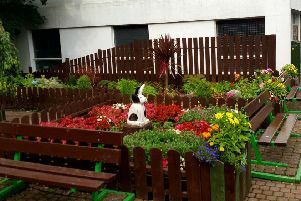 Keep Scotland Beautiful judges June Tainsh and Liz Stewart spent last Friday morning visiting various sites around Rothesay and speaking with many of the voluntary organisations who keep our town beautiful as part of Bute in Bloom. From the Rabbit Garden to open spaces, nothing was missed by eagle-eyed June and Liz. The judges also saw the various plots and projects at Bute Produce. We caught up with them at Ardencraig Gardens as they were shown round by Jimmy Lilley. June said her first impression of Rothesay was that it is a very beautiful place, with friendly people and a strong sense of community. She said: “There is also a lot of respect for the heritage of the island. I think that links generations. Both Liz and June said that they will be looking forward to returning and viewing progress. Now the waiting begins, as the result will not be known until September 7.